There is a lot of talk these days out of Washington regarding “public-private” partnerships in solving the economic difficulties our economy is in. And it makes a lot of sense for government and business to work together to maximize the effect of programs and policies. There is another public-private partnership that works well together but can be even more effective if boat dealers thought more about it – US Coast Guard Forces and boat dealers working together to raise boating skills and seamanship levels at the point of purchase. This column is about that. In many states, including New York, there are no state licensing requirements for boat drivers. The old saying goes, “Any idiot can buy a boat and some do!” and it often rings true when you read about some of these horrific accidents at sea – usually encompassing boating and alcohol. What’s a body to do? Well, how about getting your body into a USCG boating safety class? There would be little argument that the best place to instill a deep need for boating skills and seamanship abilities, other than at the dinner table while growing up, is right at the point of purchase. Now some boat dealers might think that bringing up such a subject as boating skills and seamanship will scare off a buyer or cause the buyer to buy a smaller, more manageable boat instead of the battle-wagon being eyed… There may be some argument to that but most boat dealers know that showing such concern for the safety of the client creates a client for life. And that means follow-on sales and deep, satisfying relationship. Less “altruistically”, a guy who wrecks his expensive boat, or worse, is more likely to sell the boat and never come back. 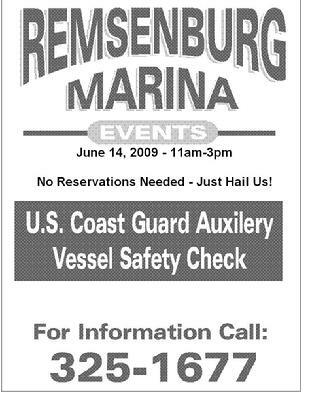 If the skipper is knowledgeable and the boat meets USCG standards, that is a great mix. There is a much bigger idea than just referring the customer to the internet. What about classes at the show room? Some boat dealers also have marinas. In our division (USCG Auxiliary Division 18 covers the eastern half of Long Island, NY, encompassing 3 USCG stations and tens of thousands of boaters), we have run boating safety classes in many dealer show rooms or their conference rooms and all the boat owners walk out waving at the dealer saying “thanks so much for arranging this!” And the boaters pay a fee for the class which goes towards further boating safety activities. Out of pocket for the dealer – coffee and cookies? What will the Vessel Examiner look for? click here! 1. If a life raft is on board be certain it has a current inspection on the raft and hydrostatic release mechanism. 2. If an EPIRB is on board, be certain it is registered to the boat and that the registration is current. If it is hydrostatically deployed be certain the hydrostatic release mechanism is in date. Be certain the battery is in date and working. 3. If survival suits are on board, unpack them and be certain there are no tears or dry rot. Be certain working lights and a whistle are attached. Be certain the zipper is operable (if it needs waxing, wax it!). Be certain the vessel name is stenciled on the back of them as well as on your life jackets.